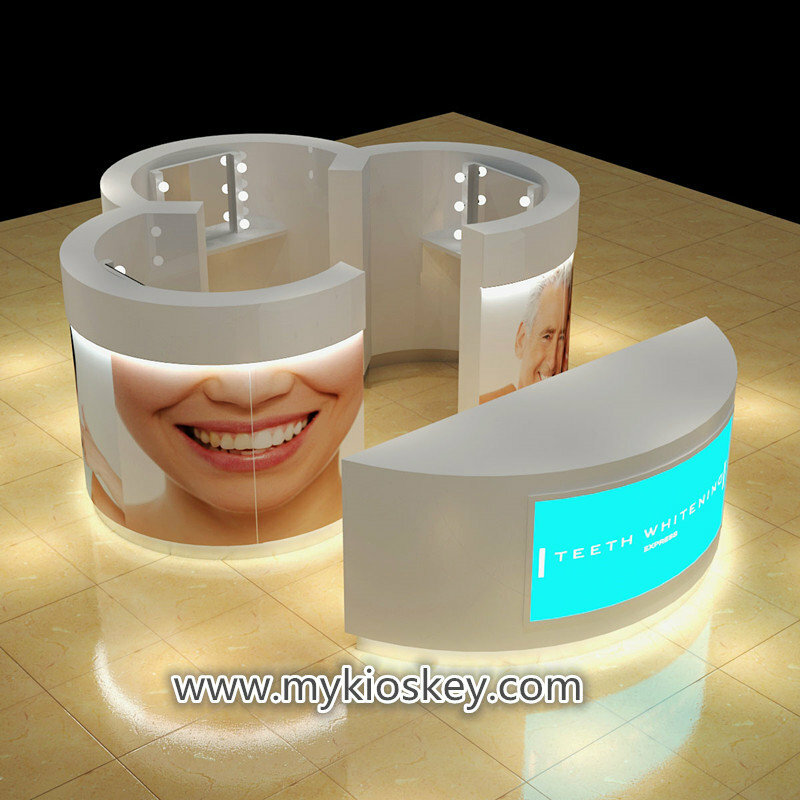 Teeth whitening is becoming more and more popular, More and more people are paying for brighter, every day many customers asked about mall teeth whitening kiosk , today i will share some design of teeth whitening kiosk for reference , no matter what you are making chain brand or first time doing teeth whitening business, find us will is right choose , we can build creative and unique teeth whitening kiosk . flower shape is very elegant and special , no matter clients from outside seem it or when you are doing teeth whitening in inside , it all is very beautiful, you also can enjoy own private space . every station all with mirror and beauty bulb , below of counter no any storages , only is for clients to put legs. i think this is very comfortable design . the outside of station wall, we make stickers to put big posters , of course the middle area , we make light board for advertising . make up teeth whitening station’s deficiency. 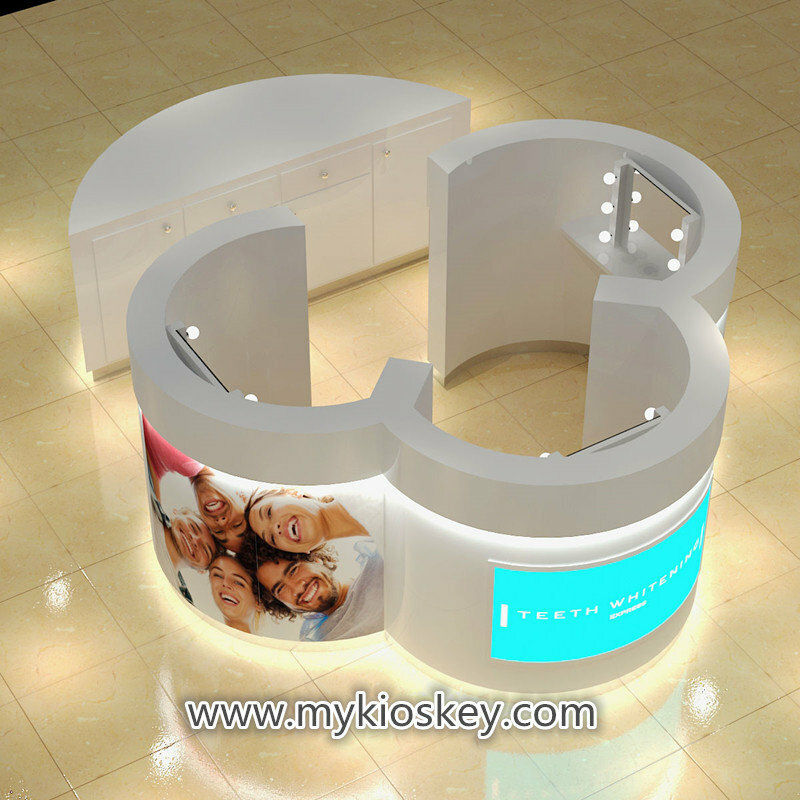 the kiosk really is very simple and elegant , how about your feeling ? alright , if this one is not enough attract you , let’s us go on next design . Smile lounge , if you want do teeth whitening business , you should know about it , very famous brand . we made this kiosk for this brand . this design looks like is very modern and attractive . 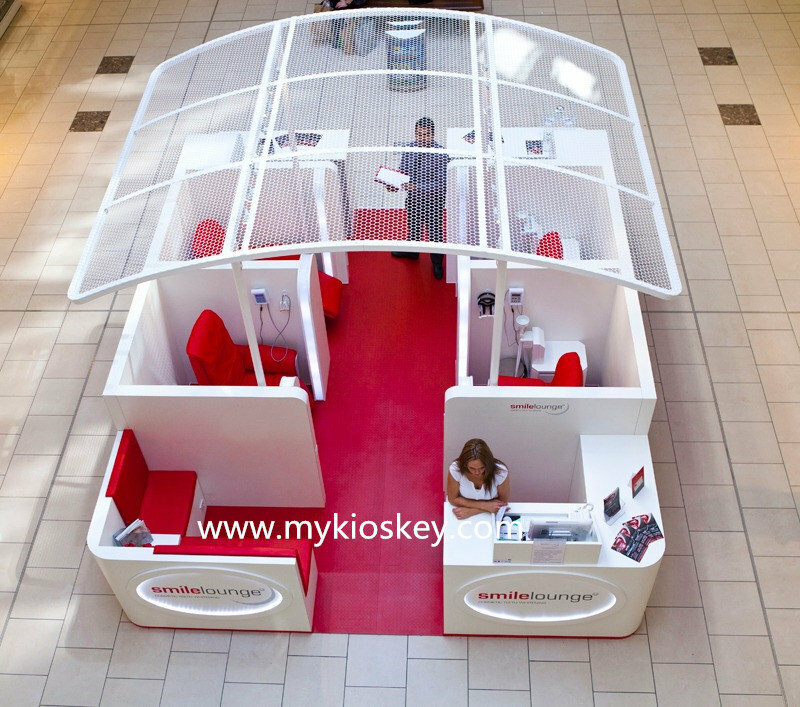 red sofa and chairs match white kiosk, so striking contrast, deep attract clients eyes. red chairs and red floor make people very excited and happy , the design make 2 entrance , the staff will service each entrance , very good service.front entrance for check-in and clients seating relax sofa. the back entrance is information desk. on the top we make a grid roof with spot light , when night still can service clients more better . do you like this design ? thank you for your time, if you plan make teeth whitening business , welcome send inquiry. PreviousPrevious post:Some successful sweet candy kiosk project for share NextNext post:How to choose the right stone for customize furniture?